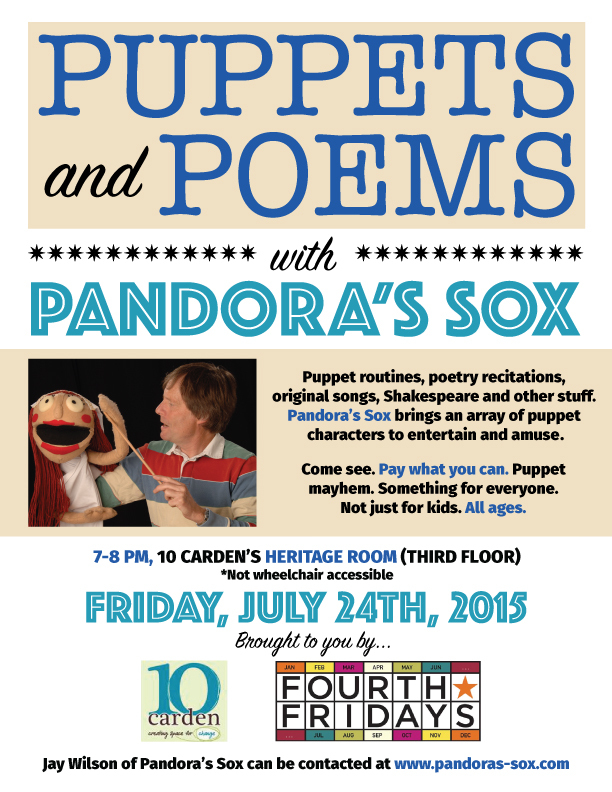 Local puppeteer Jay Wilson will be presenting “Puppets and Poems” with his puppet and entertainment company Pandora’s Sox. Who is the man behind Pandora’s Sox? Jay is a member of the The Ontario Puppetry Association, The Guelph Arts Council and a former member of the Canadian Actor’s Equity Association. In addition to maintaining a career as a professional stage actor primarily in Ontario’s summer theatre seasons, Jay has been company manager and theatre development/administrator for The National Tap Dance Co. of Canada, The Gravenhurst Opera House and Theatre Collingwood. While at The Gravenhurst Opera House and Theatre Collingwood Jay established drama training programs for both adults and children. Jay also taught drama at Conestoga College and Georgian College as part of their continuing education programs. Jay was introduced to the world of puppetry back in 1979 having just graduated from the University of Waterloo in drama and theatre arts. Jay spent several years touring an educational show for children called “Health-spell”. This is where the ‘teaching through theatre’ theme in Jay’s work began. Jay was the Special Projects Developer for The Ontario Lottery Corporation where he established a mobile stage project and designed large scale outdoor events to coincide with Winterlude, Caribana, Canada Day Ottawa and other Lottery sponsored events. Combining skills in performance, writing, teaching, music, arts marketing, theatre administration, and tour logistics, Jay’s puppet and entertainment company, Pandora’s Sox, now employs Jay full-time. In addition to a puppet workshop entitled “Puppet Secrets”, Jay performs elocutions, custom songs and other ‘entertainments’ at special occasions of all kinds. Call Pandora’s Sox at 519 837 1743. Pandora’s Sox is on social media! This entry was posted in Fourth Fridays, Literature, Performance and tagged 10 Carden events, all ages events Guelph, Fourth Friday's events, Guelph events by Fourth Friday. Bookmark the permalink.